We all use mathematics everyday. At least that is what we all like to tell our friends who ask us, “What good is math anyway?” The problem is so much of this everyday mathematics is, how should I say this, non-obvious. No one thinks they are doing mathematics when they figure out the larger peanut butter is not actually a better deal than the smaller size or when they cut across the intersection diagonally to save time or when they decide to ask that friend they don’t really talk to much to spread the word about their new project because that friend has more friends than they do(not that I have any history doing this last one, no history in doing it at all). Sure those are just algebra, geometry, and network analysis problems deep down, but they are also just normal every issues. 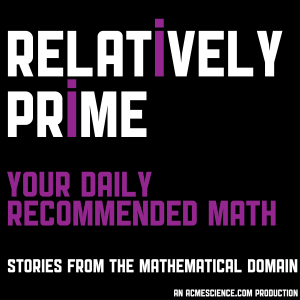 In this episode of Relatively Prime we look at three regular, everyday problems and use mathematics to make them a bit more comfortable, a bit more pleasant, and, in the case of the first story, a bit more delicious. Oh, and we have a couple quick pieces of advice about how to make pumping gas fun and tipping more secure. Samuel was talking to Matt Parker, on of the nerds in The Festival of the Spoken Nerd and author of Things to Make or Do in the Fourth Dimension which sadly is only a three dimensional book, and asked him if he had any everyday tasks which mathematics could make better. His answer will change how you pump gas forever. Say you are living in a new city and you haven’t made any new friends yet and your birthday is coming up. This was the exact situation Samuel was in last year. He still wanted to have a cake though, but as he was by himself Samuel was worried if he cut his cake in the traditional way it would go stale. Enter Alex Bellos, Guardian Columnist, author of Here’s Looking at Euclid, The Grapes of Math, and, with Edmund Harriss, the math coloring book Snowflake Seashell Star, to tell Samuel about Sir Francis Galton’s perfect cake cutting technique. Of course since Samuel recorded the interview with Alex before his birthday something was going to have to happen to make it not relevant. In this case it was a happy occurrence, Samuel actually made a friend with whom he could celebrate his birthday. Which was awesome, except it meant Alex’s cake cutting method wasn’t going to be too useful. Samuel wasn’t going to have a birthday without a mathematically appropriate cake cut though so he called up Steven Brams to determine how to fairly divide his cake between him and his new friend. Of course this meant Samuel needed to go get his birthday cake, and in order to do that he was going to need to find himself a parking spot. For most people this is an everyday problem, but since Samuel usually rolls out of bed and lands in front of his microphone he needed some help to choose the best spot to choose when buying his cake. Thankfully Laura Mclay, who writes the blog Punk Rock Operations Research, had his back or he would probably still be driving around the bakery’s parking lot. Imagine this: It is a Thursday night and the pub a few blocks away has an Irish music night you really like, but it is a small pub and when there are a lot of people there you don’t enjoy yourself. Should you go to the pub or should you stay home? This is the exact problem W. Brian Arthur found himself having in Santa Fe with the El Farol Bar in the early 90s and being trained in economics and mathematics Brian did the logical thing, he wrote a paper on it. The Three R’s, Reading Writing and ’Rithmetic, have formed the basis of formal education for centuries, at least since they were mentioned by Sir William Curtis in 1795, even if he probably used Reckoning instead of ‘Rithmetic. Most of the time though the three R’s can be simplified down even further to the two Glyphs, Letters and Numbers. For most people ‘Rithmetic or reckoning or mathematics or what ever you want to call it, falls directly under the umbrella of numbers. That is not incorrect. Numbers are very much mathematics brand. Numbers are how mathematics is represented to children from a young age and when you show an aptitude for the subject you are often branded a numbers person. There is even a youtube channel featuring videos about cool mathematics called Numberphile. But mathematics is more than numbers, and before you go making a joke about how of course it is otherwise we could never solve for x, mathematics is more than individual letters too. Letters, and that thing you get when you put a bunch of letters together and make them into words and then you take those words and you put them together according to some set of rules called language, plays a very important role in mathematics. This episode of Relatively Prime, The Lexicon, explores this role. One of the things about the language of mathematics is a lot of it comes from language, like from the languages that we speak. To be fair not the actual languages we speak, at least not that we speak anymore. Unless you just happen to be a scholar of Greek, Latin, or Arabic. This is where Anthony Lo Bello’s Origins of Mathematical Words: A Comprehensive Dictionary of Latin, Greek, and Arabic Roots comes in. Samuel was joined by Anthony for a conversation about the dictionary and some of the origins therein. A discussion of mathematical language which only touched on mathematical words would be really unsatisfying. It would probably feel like only one half of a dialogue. This is of course because it would be skipping over half of what constitutes mathematical language, it would be skipping over symbols. Today symbols are just as much part of the language of mathematics as words. This is a surprisingly recent development. For example, when Algebra was first being developed it was entirely in prose. Joseph Mazur wrote about how symbols were developed and integrated into mathematics in his book Enlightening Symbols and he spoke to Samuel about the evolution of symbols and how they have changed mathematics. There are two words which can elicit a groan in almost any mathematics classroom, word problem. Thankfully this does not have to be the case. Tharanga Wijetunge and Kirthi Premadasa are here with the solution. Their research has shown that using different language to frame the problems can help students not only enjoy the problems more, but also better recall the mathematics. Tim Chartier is a person who spends half of his life trying to find stories within mathematics and the other half telling those stories in as many ways as possible. While this would be a hard enough task if Tim just wrote books, made videos, and gave podcast interviews. All of which he does, but Tim, along with his wife, have gone one step farther and now tour the world tell mathematical stories without any words at all. That is right, they do mathematical mime. Mime-matics – The Plunger from Tim Chartier on Vimeo. Mime-matics – the infinite rope from Tim Chartier on Vimeo. Even though no on asked for it Samuel did it, he brought back Combinations and Permutations. Really he did it for a segment of Relatively Prime, but in the end it is the same result: More ridiculous mathematical jokes and tangents. For this special episode he got some of the old favorites, Nathan Rowe, Sean Breckling, and Brandon Metz, back together in the mail room of UNLV CDC Building 7 to record an episode all about what mathematicians do all day. 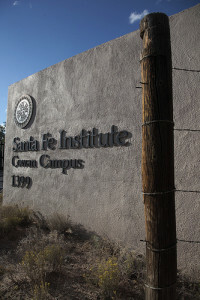 On this episode of Strongly Connected Components Samuel Hansen travels to Santa Fe to speak with three of the researchers at the Santa Fe Institute. He speaks with Yoav Kallus about packing oranges, Sid Redner about statistical physics, and Josh Grochow about complex systems. Plus, so much more. Follow @Samuel_Hansen on twitter too! On this episode of Strongly Connected Components Samuel Hansen is joined by mathematician Katie Steckles. They discuss how ER influenced her to study mathematics, just what the word mathematician encompasses, and what a mathematician in residence does. 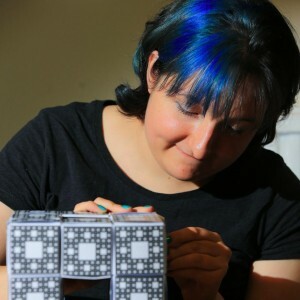 Be sure to follow Katie on twitter, check out her work with Think Maths, and her other mathematical communication work.